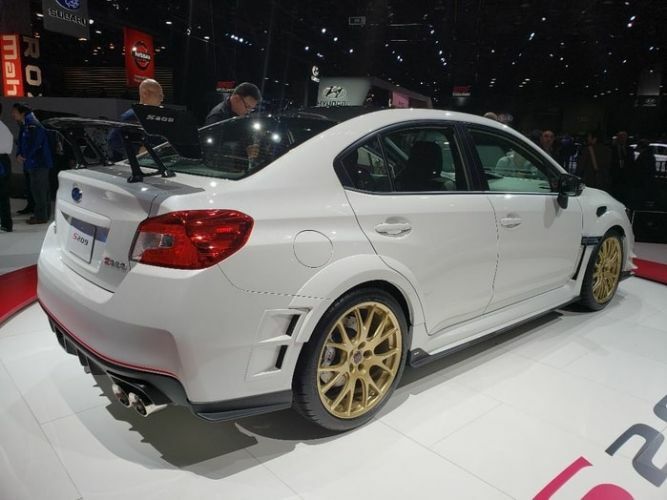 Subaru Corporation and Subaru Tecnica International unveiled the 2019 WRX STI S209 at the 2019 North American International Auto Show for U.S. performance fans. 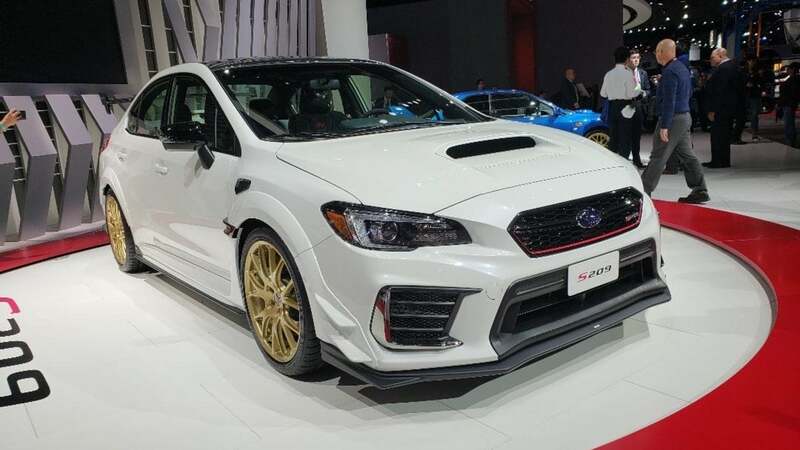 The highest-horsepower ever STI sedan was officially unveiled at the press day event in Detroit with much anticipation and excitement because this is the first “S-line” STI model launching in the U.S. and outside of Japan. Before now, it’s been forbidden fruit. The WRX STI “S” Series have been Japan-only limited edition models up until now, but that all changes as Subaru of America told Subaru Tecnica International, they want one for U.S. performance fans. Here are the full details on the new S209. 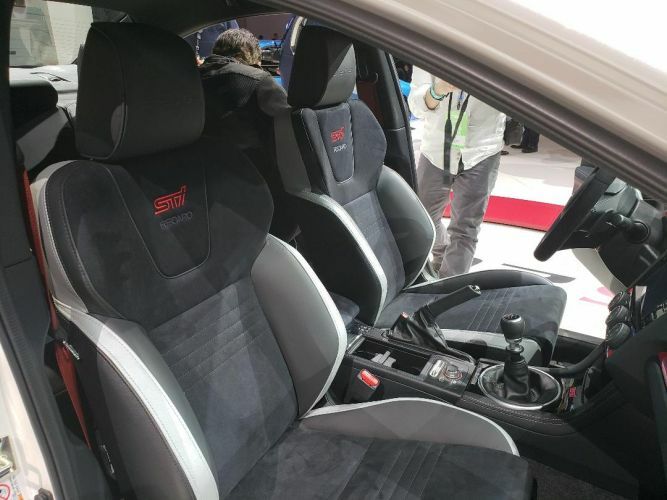 There were big questions what would power the S209 since the Japan-spec S208 revealed last year at the Tokyo Motor Show, came powered by an STI hand-built EJ20 2.0-liter DOHC 16-valve dual AVCS twin scroll turbo boxer producing 329 PS (325hp). What do U.S. fans get? The good news is, the STI S209 will be available exclusively in the U.S., but the bad news is there will only be a limited production of just 200 examples shipped to U.S. shores. The 2019 Subaru WRX STI S209 will be the highest horsepower STI ever produced. It’s powered by the EJ25 2.5-liter turbocharged Boxer engine that has been “thoroughly reworked” by Subaru Tecnica International and comes with an estimated 341 horsepower. To produce the extra horsepower, STI fitted the EJ25 with an HKS turbocharger, a larger turbine and compressor (up 6 and 8 percent, respectively, compared to WRX STI) as well as maximum boost pressure that has been increased to 18.0 psi (16.2 psi for WRX STI). It also features forged pistons and connecting rods that are lighter and stronger. Midrange torque gets a notable bump, up 10 percent at 3,600 rpm. An exclusive close-ratio 6-speed manual gearbox sends power to all four wheels. Other Subaru Tecnica International engine upgrades include a high-flow intake system featuring a new intake duct, induction box with conical air filter, silicone turbo inlet duct and, a nod from the 2004-07 WRX STI, an intercooler water spray system that lowers intercooler temperature via manually operated steering-wheel paddles. The S209 also receives a new high-flow fuel pump, larger fuel injectors, and an STI-tuned engine control module. High-performance mufflers deliver 17-percent less airflow resistance while larger hand-polished stainless-steel exhaust tips, 101mm in diameter. The all-new S209 draws from the WRX STI Nurburgring Challenge car, which won the Nurburgring 24-hour race last year. The STI S209 wears an expanded wide-body exterior treatment, which extends the vehicle’s overall width to 72.4 inches, 1.7 inches wider than a standard STI. It comes with wider front/rear tracks (+ 0.6 in front/rear) and lightweight 19 x 9-inch forged BBS alloy wheels wrapped in 265/35 Dunlop SP Sport Maxx GT600A summer-only tires with improved grip. Vents on the front fenders provide additional engine cooling, while vents on the rear fenders rectify air turbulence to reduce drag. Brembo brakes, with cross-drilled steel rotors and 6-piston monoblock front calipers and 2-piston monoblock rear calipers, give the S209 additional stopping performance, with upgraded high-friction pads that deliver improved fade-resistance. Underneath, the higher-performance S209 gets Nurburgring racecar tech with specially developed Bilstein dampers, stiffened coil springs, a 20mm rear stabilizer bar and pillow-type bushings for the front/rear lateral links. It also gets reinforcements to the front cross member and rear subframes and a flexible front-strut tower bar and flexible front/rear draw stiffeners. Front, rear, and side under spoilers; front bumper canards; and carbon-fiber roof panel and rear wing round out the additional Nurburgring racer tech. Inside, the S209 comes with an STI badge on the center of the D-shape steering wheel, which is wrapped in Ultrasuede with silver stitching, which carries over to the lid of the center console storage box. An S209 serial number badge resides on the center console, and S209 badges adorn the passenger-side dash and the headrests of the Recaro front bucket seats, which feature new silver-hued inserts. Available exterior color/BBS wheel combinations will be WR Blue Pearl with gray wheels and Crystal White Pearl with gold wheels. Pricing will be announced closer to dealer launch in late 2019. You can see the 2019 Subaru WRX STI S209 at the North American International Auto Show in Detroit which is open to the general public from January 16 through January 27, 2019.